I have a confession. I spent the last week watching telenovelas (soap operas). I learned a few things though. First, telenovelas are very dramatic. Second, his family got a kick out of that and recommended cartoons as well. Lol Third, his grandfather was happy that I tried. We had a wonderful conversation about the importance of trying. Grandpa was adamant that you needed to try new and difficult things in life. He reminded me that failing is part of the process but no progress would be made without putting yourself out there and putting in an effort, despite the challenges. That I hadn’t thought to explore. So I never had dared. 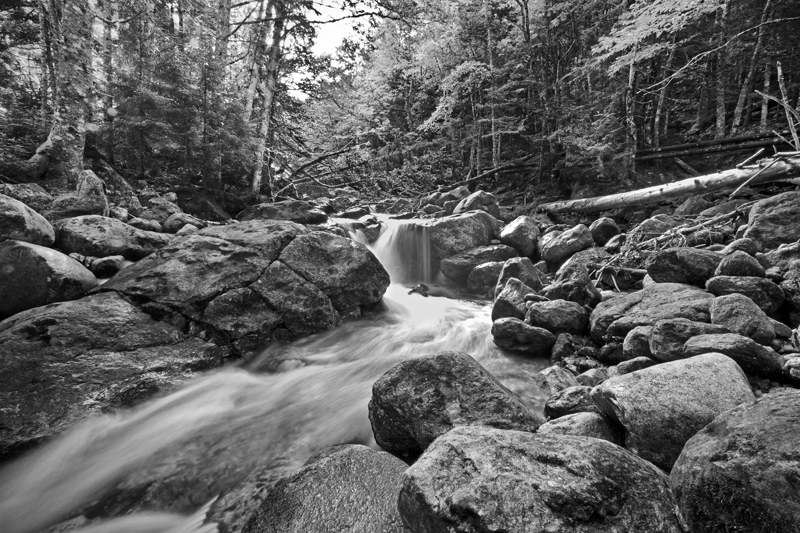 This is an image of Crawford Notch, in New Hampshire taken last fall on a scouting trip with my photo partner in crime (partner in photo?) David Pasillas. There is something very powerful and empowering about just exploring, finding beautiful spaces and the capturing memories. As I said in a recent interview with Laura Macky, I wonder how long some of these spaces will be around and I feel so grateful that I am able to see and experience them before they change, for better or (more likely) worse. The sky was full of movement that day, opening and closing windows between the clouds. I took a few versions of this over the course of perhaps 15 minutes, and the highlights of the landscape were significantly different for each. It wasn’t the golden hour, or the deep shadows of blue hour…but watching the light dance across the scene was its own brand of magic. I suspect I might be dating myself here, but for those of you who remember the time when vinyl was king…you’ll probably also remember the term B-side. For those of you who aren’t familiar with the term (aka…young’uns), side one of a record was generally reserved for the songs that the producer or record company intended to be the hit. The other side of the record (or cassette, for you children of the 80’s), had everything else. Generally speaking, the songs on the B-side weren’t quite as shiny, pop-y, catchy or marketable. Well, my photography process also has a B-Side. 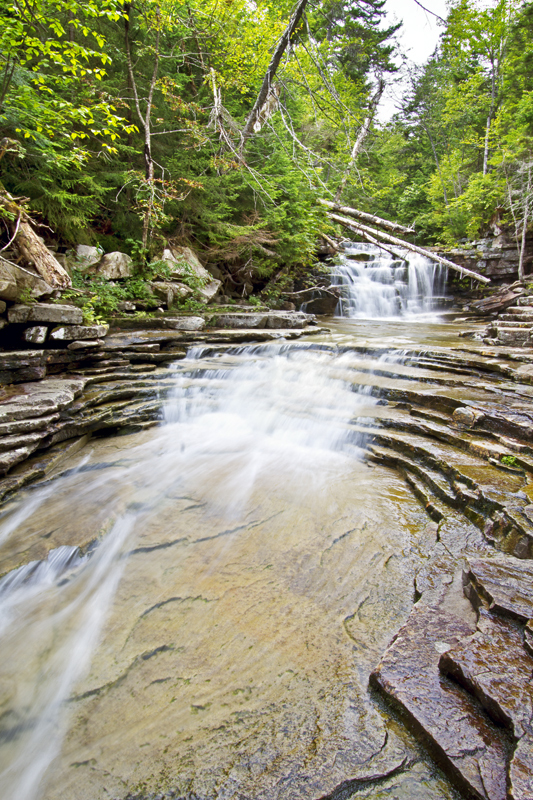 When I get home from a shoot or trip, my first instinct is to edit the stand out images. The ones that just scream for attention. They’re well composed, well exposed and just damn purty. And then…there is everything else, which honestly, often gets forgotten. As you all know, I’m running a fundraiser for the victims of Typhoon Haiyan. (50% of profits from sales through December 15, go here: www.zazzle.com/skalahan) Turns out, zazzle is also running a deal through 11/21 (sorry, I know, not much notice)…use the code HOLIDAYCOUNT for up to 60% off! And I’m pretty sure it is on the production end, not mine, so the donation to the Filipinos will be the same! Today’s blog post is a joint effort between myself and my friend Will of http://www.wheretowillie.com. As I’ve mentioned before, I think it’s important to have others involved in my photo-experiences, so when Will suggested a fun experiment, I was game! The idea was that we would both start with the same files out of the camera – in this case, an image I shot on New Year’s Day – and develop them in our own style, with no hints or previews or the like, and would then share them both with everyone here! 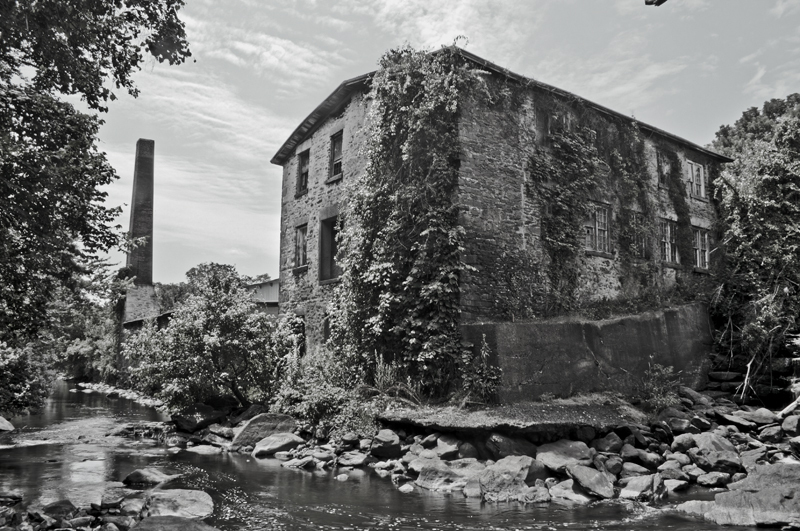 This photo is of a textile mill about 15 miles from my home (a bit more than that for Will!) and I’ve driven by it countless times, every time thinking the texture of the building and the movement of the water would make a great photo. The first of the year rolled around and decided it was time to give this half-formed photo idea a shot. January sunsets here in CT are right around 4:30p EST. 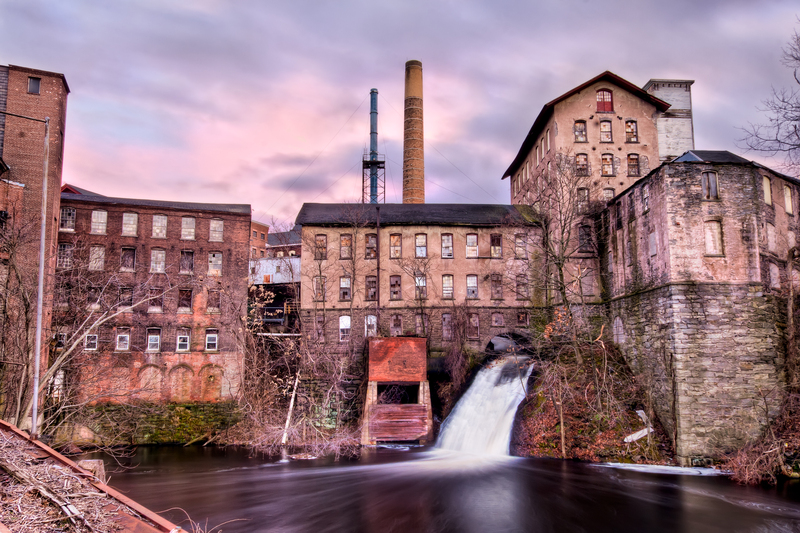 I got to the mill at approximately 3:15p and walked around a bit trying to find a good angle. The mill property is surrounded by a tall fence covered in ‘No trespassing signs’, so in the end, I decided my best bet was to try to shoot above the fence (aka, above my head). Once I decided on the location, I backed my Subaru up to the fence and pulled out my tripod. Two of the three tripod legs were on the tailgate, and the third was wedged securely into the chain link fence. I locked the focus, then cranked the tripod to it’s maximum height, which of course means I couldn’t look through the view finder to compose the shot! In order to adjust the composition, I took a sample shot, stood on my tip toes (and I’m not short by any means!) to look at the display screen, adjusted the camera, took another test shot… When I was finally satisfied with the composition, I set up my brackets and took several series, trying to catch both the colors of the sunset and the clouds rolling in for the rain forecasted that night. I’ve mentioned before that I think working with other photographers is a great inspiration. In this case, I think it’s incredible to see Will’s version of the image for a few reasons. 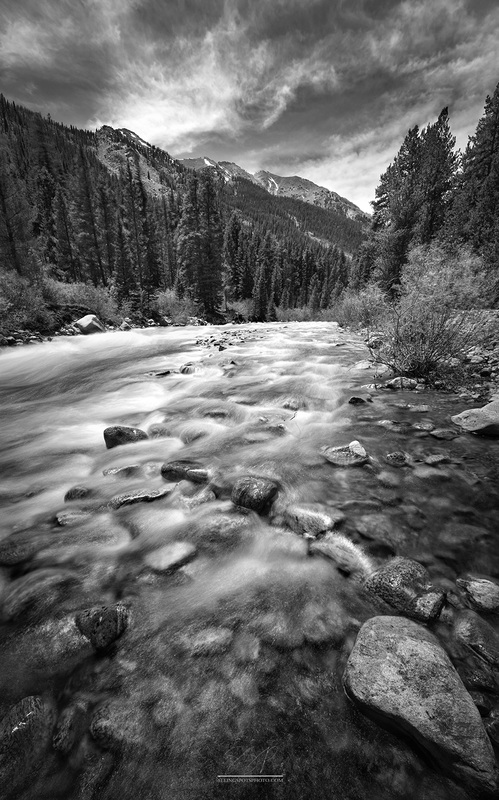 First, it’s a great learning tool to see someone else’s editing process and vision for an image. Second, it gives you a peek into who they are as a person, and how they see the world. Furthermore, it’s inspiring to see how much potential any given image has. Despite it being the same image, processing it in two different ways (Will with HDR, myself with layered and masked exposures) gives it two different feels. It’s marked with our own particular styles, and in this case, also clearly shows some of the differences between the HDR vs Non. Shannon seems to be much more respective of signs than I am. Had there been the slightest chance of maneuvering around the fence, it would have quickly turned into more of just a suggestion than a rule. But, I suppose that’s neither here nor there, and she was cunning enough to outwit the fence with a tailgate assisted tripod stand. Now I’ve been a fan of Shannon’s processing techniques for quite some time. As she said, I’m more of an HDR person, she’s more of a layer and mask person. Now I really do enjoy developing photos, and whenever I see a really great image I think to myself ‘I wonder what my version of that photo might have looked like,’ so I’m quite happy to have the opportunity to get a chance to try it out and see how it went. I went thru a couple of different stages with this shot, and finally settled on the one you see above. 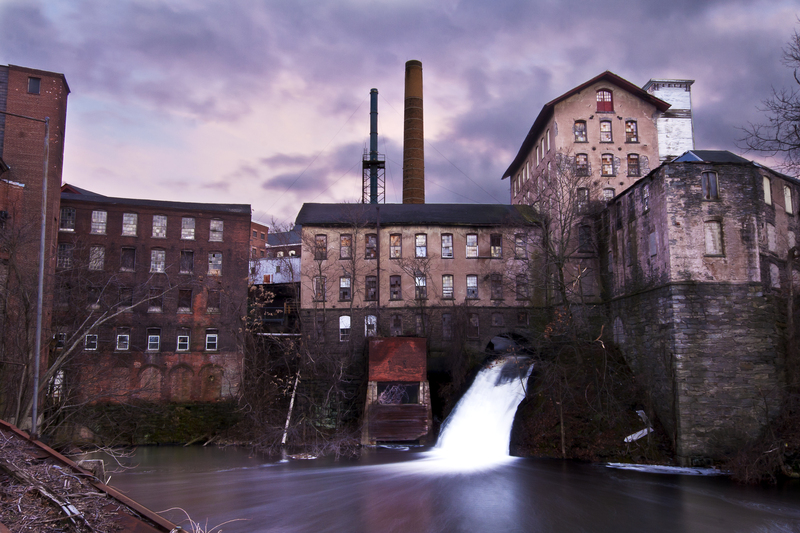 I tried to contrast the motion of the water and the clouds with the seeming longevity and statuesque feel of the mill. It’s neat to see both side by side, as I see things that I like about both of our photos that I enjoy, and that two images can come from the same place and end up somewhere different. I hope this is the first of many of these collaborations to come.